Family and friends are the center of life in the South, and kitchens the center of Southern homes, so there is no better way to celebrate Southern traditions than a book on entertaining. From the heartfelt love in Grandma’s dumplings to the stomping good fun at a hoedown, Southern entertaining is special. This book will help everyone to be as gracious, warm, and entertaining as Deborah Ford herself. She can’t help sharing—it’s the Southern way. Puttin’ on the Grits covers all the details of hosting festivities large and small. 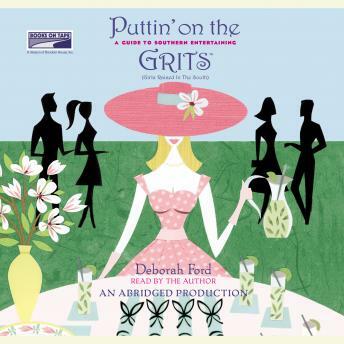 From mint juleps to charm lessons, Deborah reveals the colorful secrets behind why Southern women are such consummate hosts and captures the famous combination of elegance and wit that has become the GRITS calling card. Puttin’ on the Grits even includes a discussion of how to be the kind of guest who gets invited back. Whether popping a cork or cracking open a six-pack, every hostess can now be the belle of the ball.